Miriam Gomes shares a home with her husband and their two daughters. Writing is one of her greatest passions. She finds inspiration everywhere, but it is in the quiet of the night that her imagination runs wild and conjures up mysterious tales while following her characters in their adventurous journeys. Other than juggling motherhood and writing, she also enjoys cooking and baking; especially baking, and she so enjoys a great cup of coffee while reading compulsive fantasy novels. Kryslian is a work of fantasy fiction aimed at young adults, and written by author Miriam Gomes. In a story combining the genres of suspense, mystery, fantasy and romance, we follow our central heroine Eleze Kenzy as she encounters a group of people who will alter her life forever. Eleze soon discovers that she has a connection to a world far beyond her own: the planet Kryslian and its powerful moon goddess have selected her for a higher purpose. When she meets the Lailoken family, there are those that would hunt her down, and those that desire her for different reasons altogether. Either way, Eleze is at risk, and she needs to learn fast which risks are worth taking. Fans of fantasy romances like Beautiful Creatures and Twilight are certain to be enthralled by this charming and very magical book. Author Miriam Gomes does well to endear the reader to the main character, allowing us into Eleze’s panic, confusion and emotional vulnerability in a way that feels very true to the character’s age. The heat of the romance and the psychological content of it is very suited to the YA genre, and the implications that leading man Edrick is fighting against with his family make for a great doomed star-crossed lovers feel. I also liked the mix of science fiction planetary drama alongside more traditional fantasy magic elements. 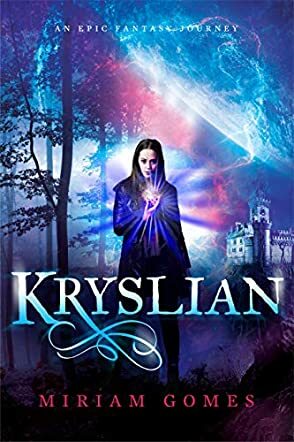 Overall, I would certainly recommend Kryslian for fantasy fans and young adult readers who are seeking a mysterious and dark magical fantasy that has a strong romantic twist.